HAWTHORNE, United States: A modified Tesla Model X drives into the tunnel entrance before an unveiling event for the Boring Co. Hawthorne test tunnel. HAWTHORNE, United States: Elon Musk on Tuesday took a break from futuristic electric cars and private space travel to unveil a low-cost tunnel he sees as a godsend for city traffic. The billionaire behind Tesla and SpaceX late Tuesday put the spotlight on the 1.14 mile tunnel created by his Boring Company for about $10 million. The sample tunnel is part of Musk’s vision to have an underground network that cars, preferably Teslas, can be lowered to by lifts, then slotted into tracks and propelled along at speeds up to 150 mph. “The only way to solve this is to go 3D, for the transport system to match the living quarters,” Musk said of solving the problem of traffic congestion in urban areas. “It’s all relatively simple. No Nobel Prize is needed here.” An entrance to a sample tunnel was shown publicly for the first time in this city near Los Angeles as the initial stage of Musk’s project to revolutionize city traffic by zipping along below congested streets. Musk founded the Boring company two years ago as a self-financed, side-endeavor to his work at Tesla and SpaceX. 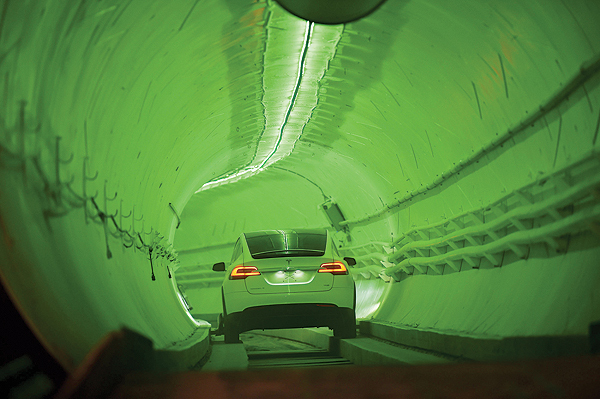 Specially designed equipment drills tunnels wide enough to accommodate a car on a track. The network envisioned is an expandable mesh of tunnels and elevators capable of having more than 4,000 cars pass through per hour. “The deepest mines are deeper than the tallest buildings,” Musk said. “The profound breakthrough is very simple: it’s the ability to turn a normal car into a passively stable vehicle by adding the deployable tracking wheels, stabilizing wheels, so that it can travel at high speed through a small tunnel.” Tunnels will eventually be open to all compatible self-driving electric vehicles, but for now Boring is using Teslas in the tube. The idea for the project came to the billionaire of South African origin when he was fuming at the wheel of his car, trapped in traffic jams between his Bel Air villa and the SpaceX offices in Hawthorne. It is a journey that takes him more than 90 minutes and he considered soul-crushing. The “tunnel test” unveiled Tuesday appeared simple: a narrow tube, only 3.65m in diameter, freshly painted white, in which a Tesla Model X is fitted with stabilizers on wheels to slot into the track and avoid bumping the walls. An early idea about placing cars on an electric sled of sorts was deemed too complex and abandoned, said Musk. The entrance to the tunnel was dug in a parking lot in Hawthorne, with an elevator platform on a street corner raising and lowering cars to the track. Journalists and others attending the event got to bolt through the short tunnel at about 40 mph in what felt somewhat akin to an amusement park ride. Musk brushed aside worries about earthquakes in temblor-prone California, repeatedly contending that tunnels were the safest place to be when plates shift and the earth shakes. The broad vision is that electric vehicles on city streets would be able to easily drop into tunnels or rise out using elevator platforms built into streets, or ramps where space allows. Boring has partnered with public transit in Los Angeles to study the possibility of connecting tunnels with subway stations. Chicago chose Boring for its project for a high-speed, capsule-shaped train connecting the city center to the airport. Requests for drilling services flow in at a rate of five to 20 a week, according to Boring president Steve Davis. For his idea to succeed, Musk must manage to slash the time and cost of tunnel drilling. Conventional tunnels take, on average two to four months to dig a mile proceeding “14 times slower than a snail” while costing a billion dollars, he said. The Boring company, on the other hand, was on the cusp of deploying a prototype “Prufrock” machine capable of drilling 15 times faster than the best gear in use now, according to Musk.